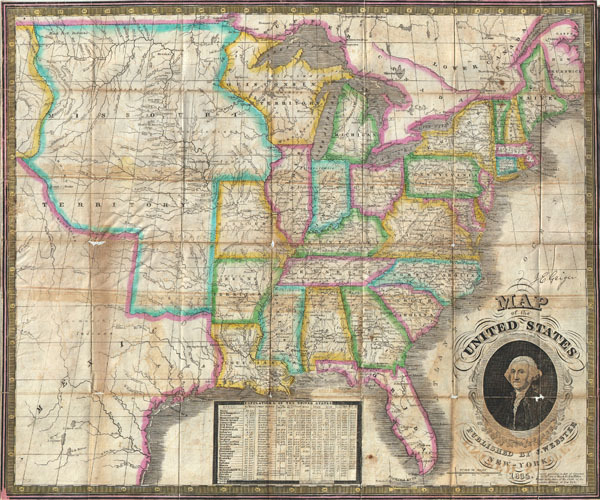 An exceptional and rare map of the United States published by James Webster in 1835. Extends from the east coast of the United States westward as far as the Rocky Mountains, including much of Texas. This map of the United States is heavily based upon Humphrey Phelps' 1832 map of the same name. In fact, a close examination of the copyright data in the lower right hand corner seem to suggest that Webster simply scratched out Phelps' name and the date 1832, in order to replace it with his own and the date 1834. We can assume that Webster must have either picked up a discarded Phelps plate, purchased the plate, or simply stole it. One of the most elegant features of this map is the portrait of George Washington engraved as part of the title cartouche in the lower right hand quadrant. Probably the work of the prominent engraver William Chapin, whose name appears just to the right of Florida, this charming portrait is a remarkable piece of engraving. To achieve this result Chapin combines several different engraving styles, including an attractive application of both stipple and line technique. Cartographically offers numerous elements of interest. Predates the formation of the Republic of Texas by one year, however does mention the region while including with Mexico. Much of the western part of this map is dominated by an expansive Missouri Territory extending from Texas north to British America (Canada) and west as far as the Rocky Mountains. Shows the course and numerous tributaries of the Missouri River as well numerous American Indian tribes throughout the region. Also shows the smaller Missouri State as it was admitted to the Union in 1821. To the south Arkansas remains a territory though it would join only one year later in 1836. Wisconsin Territory appears with the archaic French spelling 'Ouisconsin,' and includes Michigan's northern peninsula. Lake Michigan itself is slightly malformed and distended on the vertical axis. At the bottom center there is a population chart for each stat and many major cities. Removed from but accompanied by its original binder in which we also find attached a fold out 'Traveller's Guide and Statistical View of the United States.' Here Webster again seems to have used a bit of legerdemain in absconding with and copyrighting in his own name S. A. Mitchell's 1832 'Traveller's Guide.' Offers road distances, notes on boat routes, and population statistics for the entire United States. The population chart notes whites, 'free blacks,' and slaves. Further notes illness and infirmities. For example there were 650 deaf and dumb slaves in 1830. A truly remarkable compilation of data. Both the map and the index sheet are signed by one J. E. Geiger, of whom we can find no significant reference. We cannot stress enough the rarity of this particular publication. David Rumsey, who has the 1836 edition, assumed it was 'one shot issue.' The 1835 edition of this antique map rarely appears and we can find reference to it in only one major collection. James Webster (fl. early 19th Century) was a Philadelphia and New York based publisher active in the first half of the 19th century. Little is recorded of Webster's life beyond his publication of several maps in the 1830s. Webster's most significant work seems to have been his rare 1835-1836 Map of the United States, which seems to have been borrowed whole or in part from other prominent cartographers of the period including Phelps and Mitchell. Very good. Minor toning and slight loss along original folds lines, especially at intersections. Has been professionally restored and backed with Japanese paper. Margins narrow, as issued. Sabin, J., Biblioteca Americana. A Dictionary of Books Relating to America, from its Discovery to the Present Time, (29 vols), #102324. Rumsey, #3450 [1836 edition]. American Antiquarian Society, Box 2. New York Public Library, Map Division, Map Div. 00-476 .